Mr Angel said the incident occurred between 11.30pm and midnight in the Grimsby Road area of Louth. He said: "As I drove down Grimsby Road I heard a very loud jet engine sound above that of the car engine. "As I arrived outside our house and opened the car door, the noise became absolutely deafening and I noticed what appeared to be aircraft navigation lights moving over the trees opposite our house and the circling above the church. "The sound increased in volume as a trail of flame or hot exhaust gasses blasted out of the rear of the craft - similar to a jet fighter afterburner trail. This happened several times." He added: "The strange thing was that the craft was only moving at the slower airspeed one would associate with a helicopter and the movements were somewhat erratic. "However the extreme sound levels it was producing would normally be associated with a fighter plane flying at very high speed or landing or taking off. 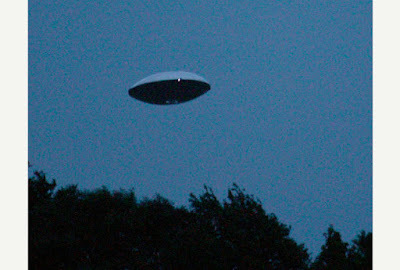 "After around four minutes of this strange and spectacular display the craft flew off quickly in the direction of the Wolds and disappeared. "Several friends also witnessed the mysterious display, and despite trawling the internet for reports and information, we have not been able to find anything out. Any ideas?" The area has a rich history with apparent UFO sightings, with several reports having been made in the past.